Rhinoplasty, Nasal Surgery, or if you prefer, the Nose Job, is one of the top five cosmetic plastic surgery procedures. In 2009, Rhinoplasty was the fourth most popular cosmetic plastic surgery procedure, and the second most popular for men. Overall, last year, 138,258 rhinoplasty procedures were performed. 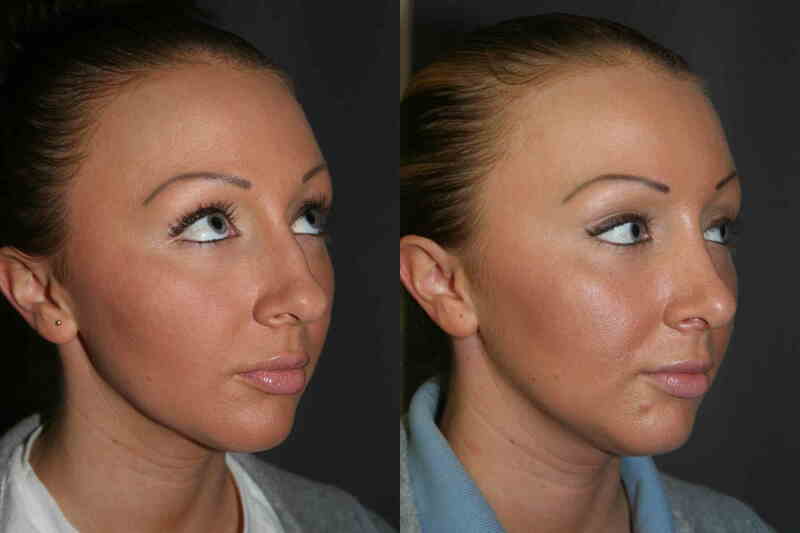 Rhinoplasty was performed to remove the dorsal hump and refine a boxy tip. With the advent of Computer Imaging, the ability to communicate what can (and can’t) be done to the nose has been greatly enhanced. Polaroid film and hand sketches have been replaced with digital images that can be modified directly on the computer screen. While limitations remain, computer imaging transforms the consultation, and the flow of information, in both directions. Computer Imaging enhances my ability to both glean what my patients are seeking, and relay what I am hearing back visually, as a picture. While computer simulation cannot be a guarantee of results, improved explanations, and resulting expectations, make the process and outcome more predictable. Since it is your picture, it is easier to see what changes will look like on your face, rather than looking at someone else’s before and after pictures. While these words may give you an idea of what the approaches are, modified pictures showing your nose with a smaller bump, a straight nasal profile or a slight scoop, makes the planned outcome much more tangible. Computer Imaging of the Nose works well for tip modification also. The width, height and projection of the nasal tip can be modified on the screen. By knowing your options, you can be confident that the best decisions are being made. For the patient show above, both areas (the nasal dorsum and tip) were modified. She had a dorsal hump and a wide boxy tip that she wanted refined. Both changes were demonstrated, before surgery, during her initial consultation appointment. This allowed me to determine the range of modification desired in both areas. The changes made served as my guide during surgery. Since the surgery has to be completed with a scalpel (and not photoshop) there are some limitations to what can be done physically, but computer imaging for Nasal Surgery is a great tool that really helps me make my patients happy. It adds predictability to a surgery where small changes go a long way. If you are considering nasal surgery, and want to schedule a consultation appointment with computer imaging, give me a call at (925) 943-6353.